After a difficult loss on Saturday, Prince Albert Mintos coach Ken Morrison challenged his team to raise their intensity levels. Less than 24 hours after dropping a 5-2 decision to the league leading Regina Pat Canadians, the Mintos came roaring back with a 4-2 victory of their own over the Swift Current Legionnaires on Sunday. The win gives the Mintos a 15-4-2 record on the year, and a happy ending to their weekend homestand. “We talked to the leadership group and said, ‘you guys have got to think of some things to get everybody ready to play. Think about what you need to be doing before the game and then try and execute,’ and they did a good job of that today,” Morrison said afterwards. Josh Pillar, Dylan Scriven, Kade McMillen and Austin Lamotte all scored for the Mintos, who struck early and often at the Art Hauser Centre. Pillar’s goal, which opened the scoring less than five minutes in, was his third of the weekend, and set the tone for a free-wheeling first period. Scriven made it 2-0 a minute later when he slammed home a rebound during a goalmouth scramble. McMillen and Lamotte added one power play goal a piece in the latter half of the period, giving the home side a 4-0 lead. Mac Gross got the visitors on the board in the last minute of the first period. Gross corralled a loose puck in the slot and fired it past Prince Albert goalie Carter Woodside, but the damage was already done. Woodside was rock solid against his old team, stopping 28 shots and keeping the Legionnaires quiet until a power play goal with 1:12 left in the game. 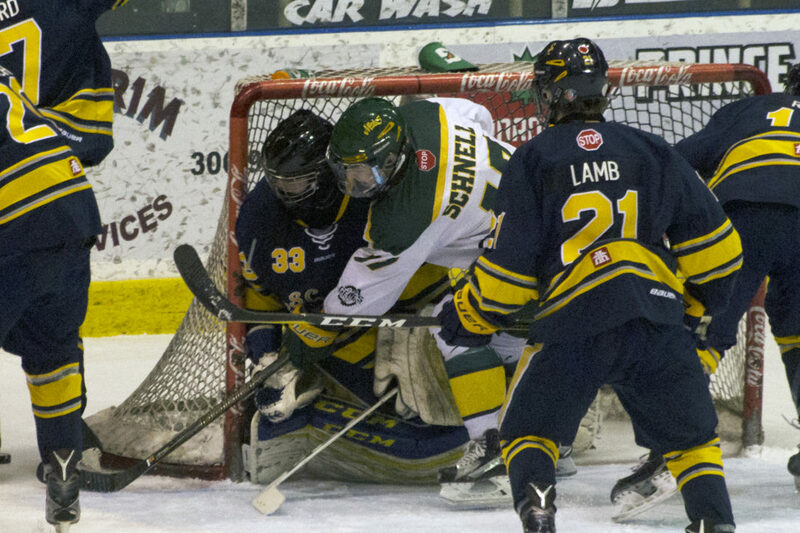 The 4-2 win helps the Mintos keep pace in a frantic race for the SMAAAHL’s top spot. As of Sunday, the club sits in fourth place, just one point behind the Tisdale Trojans, and three points behind the red-hot Notre Dame Hounds. The club has a chance to close that gap on Wednesday, when they travel to the Tisdale RECplex to take on the Trojans. Puck drop is 7:30 p.m. They then travel to Swift Current for a rematch with the Legionnaires on Dec. 10. The Mintos’ next home game is on Tuesday, Dec. 12, when they host the Beardy’s Blackhawks at the Art Hauser Centre. Game time is 7 p.m.